The company directors Brian McNaughton and Merv Clemens have both worked in the storage solutions industry for over 35 years. They formed Absolute Storage Systems in 1991 and the company quickly grew to become the highest selling outlet of the largest Australian storage products and solutions supplier. Whether you need a set of simple office containers, the refit of a small warehouse or a large complex turnkey storage & materials handling solution Absolute Storage Systems has a product or solution for you. Absolute has invested in state of the art CAD & Engineering systems to ensure the best possible professional service is provided to their clients. Absolute Storage Systems aims to give the finest service possible to local industry and commerce. The customer service team will handle all your enquiries with care and efficiency, and product specialists are always on hand to help solve any complex storage solution. Absolute Storage Systems is operated by storage & handling professionals who train and mentor new members of staff. Our employees include tertiary qualified engineers & an architect – all with significant international experience in our industry. The company’s prime position in the industry means that it can exercise considerable purchasing power. The result is quality product & solutions at competitive prices all to the benefit of the customer. For no cost and no obligation you can request an on-site visit by one of our consultants to help you decide on your optimal storage solution. Absolute Storage Systems is happy just to supply your storage solution. However we can also install it for you. In fact we can even install a storage solution that you have purchased from another supplier. 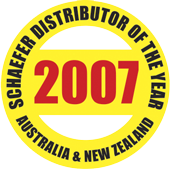 The drive for the highest possible safety standards and a determination to be able to offer customised turn-key solutions of any magnitude, led Absolute Storage Systems to partner with SSI Schaefer, the world’s largest materials handling and storage solutions company. The partnership with SSI Schaefer has proved particularly fruitful. Absolute Storage Systems has won the SSI Schaefer Award for Distributor of the Year 6 times in recent years.